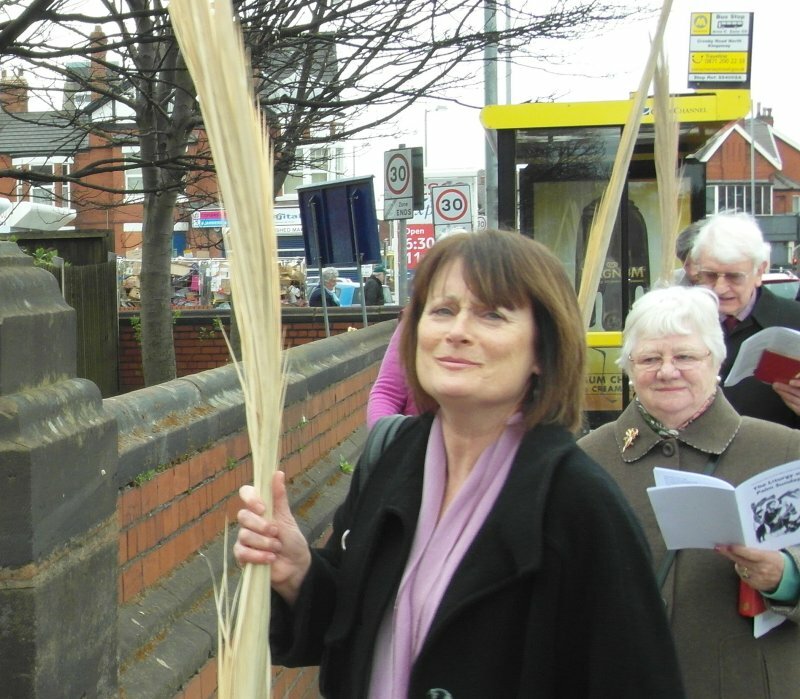 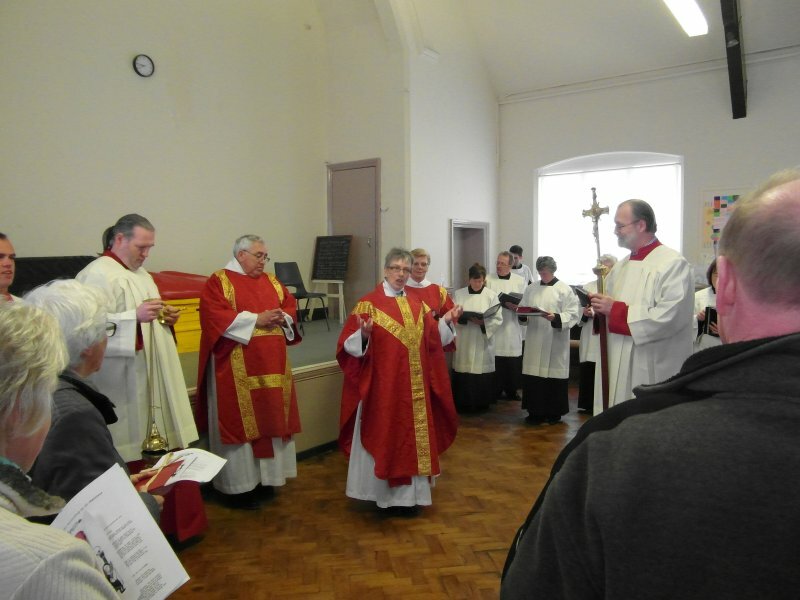 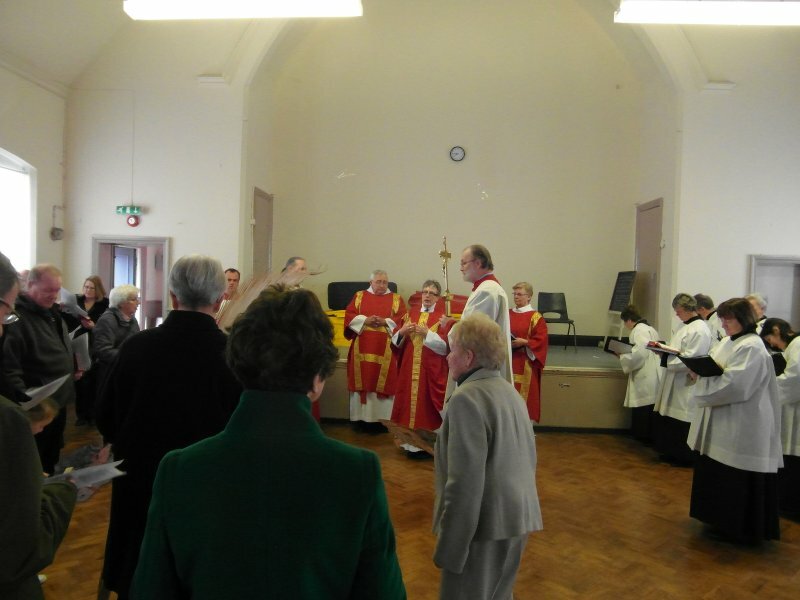 We gathered in the Church Hall for the opening movements of the Palm Sunday liturgy. 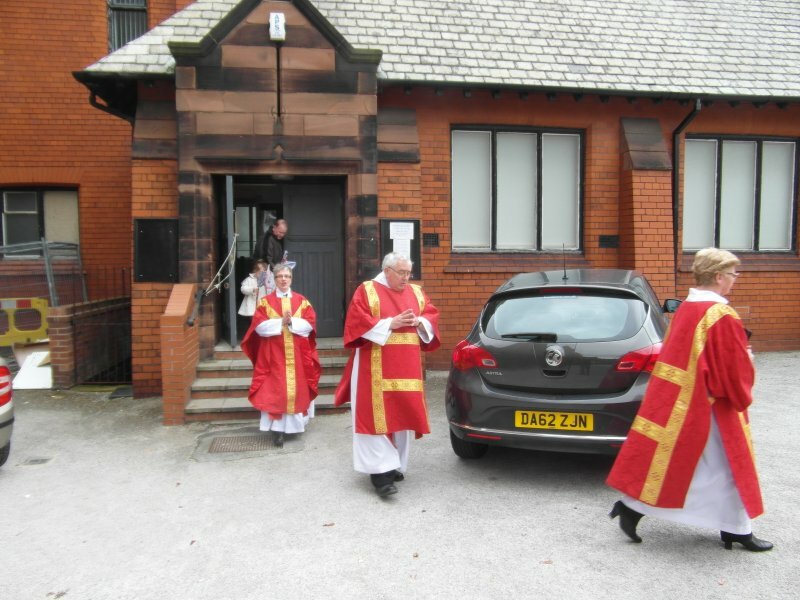 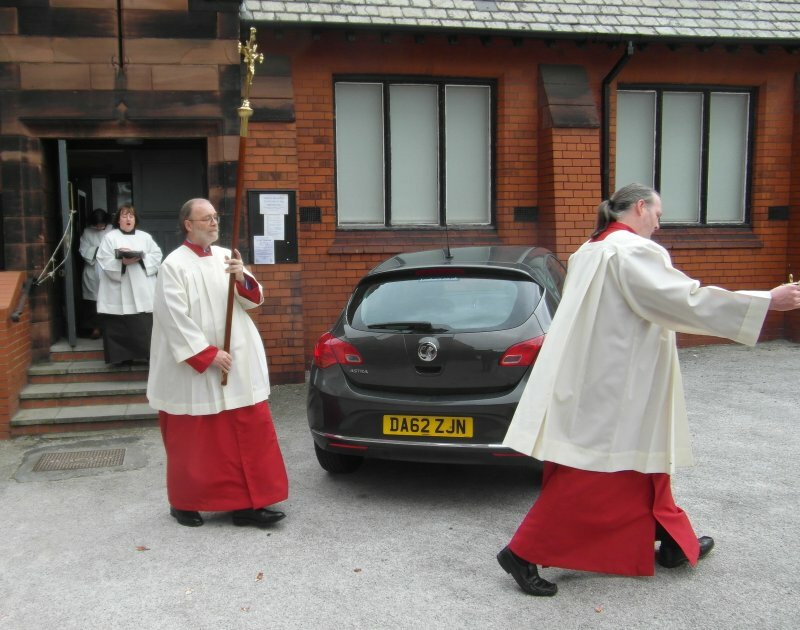 round past the vicarage and on into church for the ceremonies of the day. 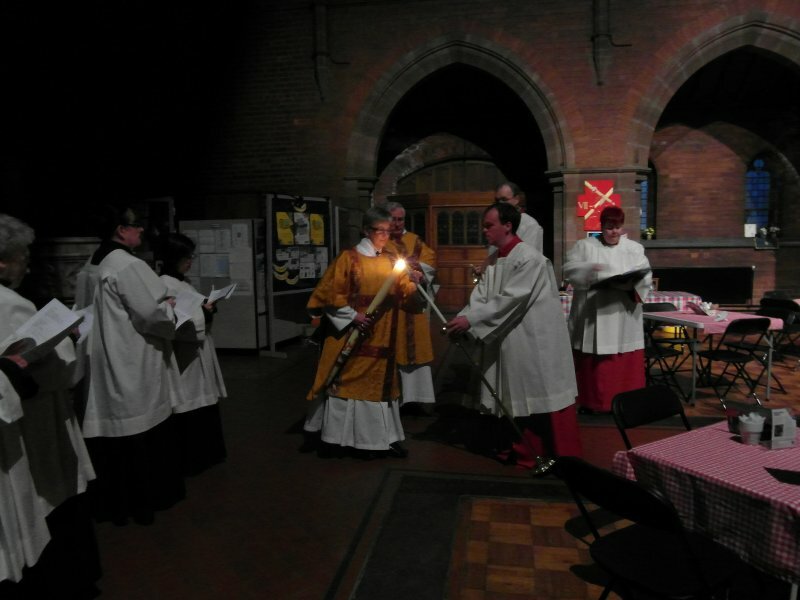 On the Thursday of Holy Week the Church commemorates the institution of the Holy Eucharist at the Last Supper. 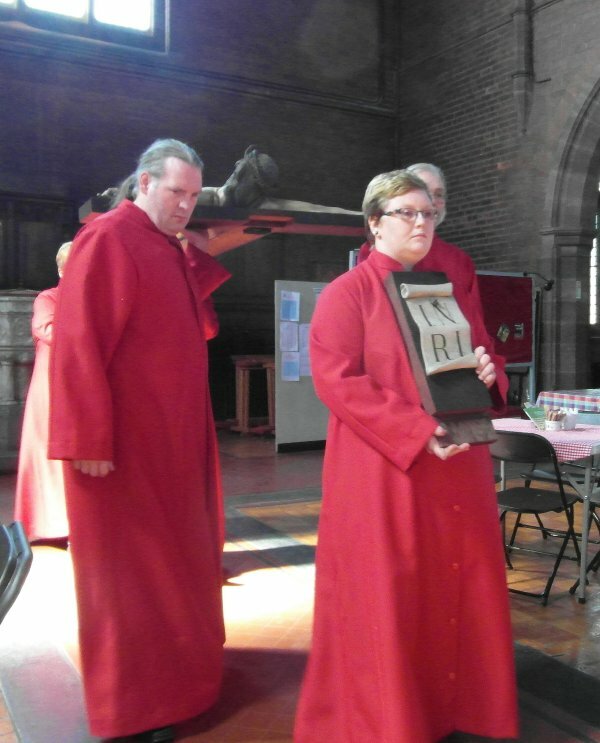 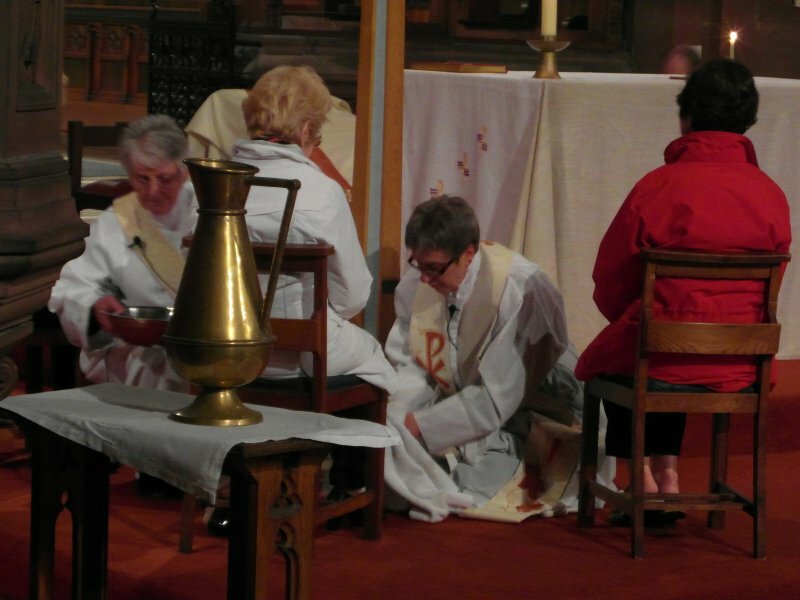 The liturgy features the symbolic washing of the feet by the clergy of members of the congregation. 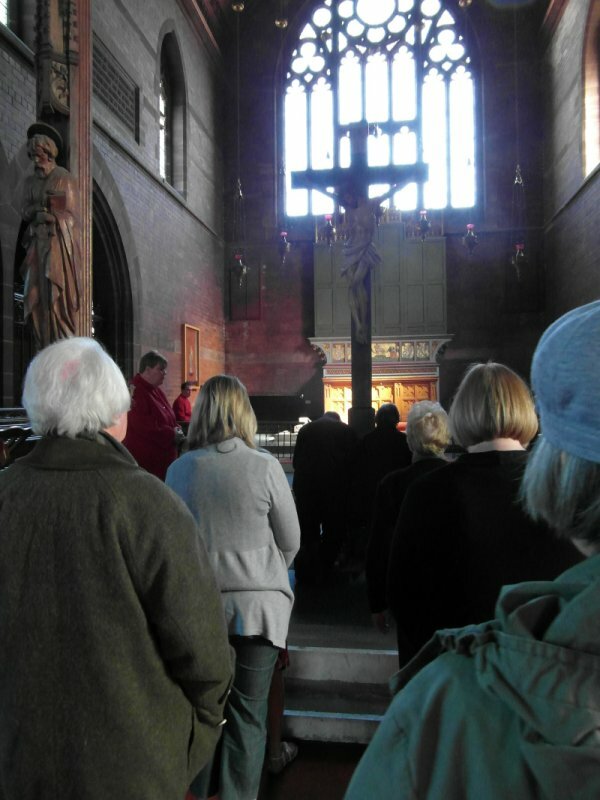 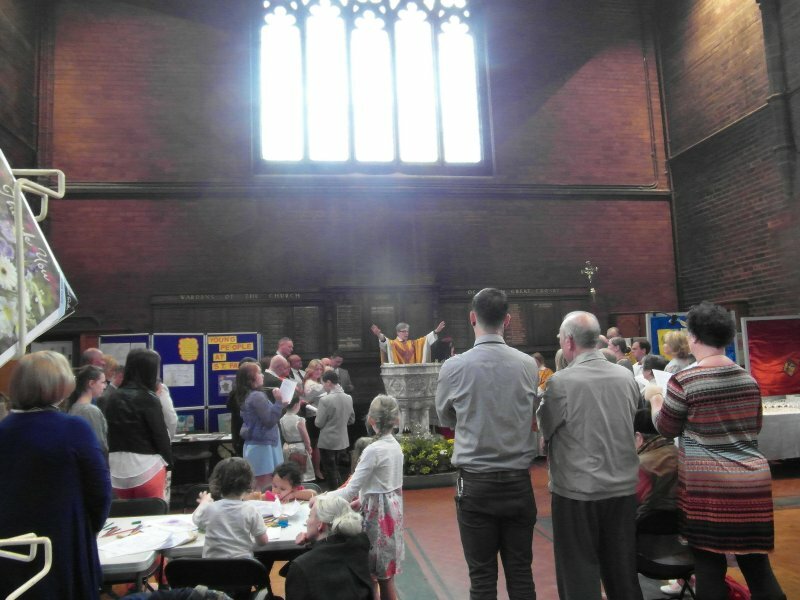 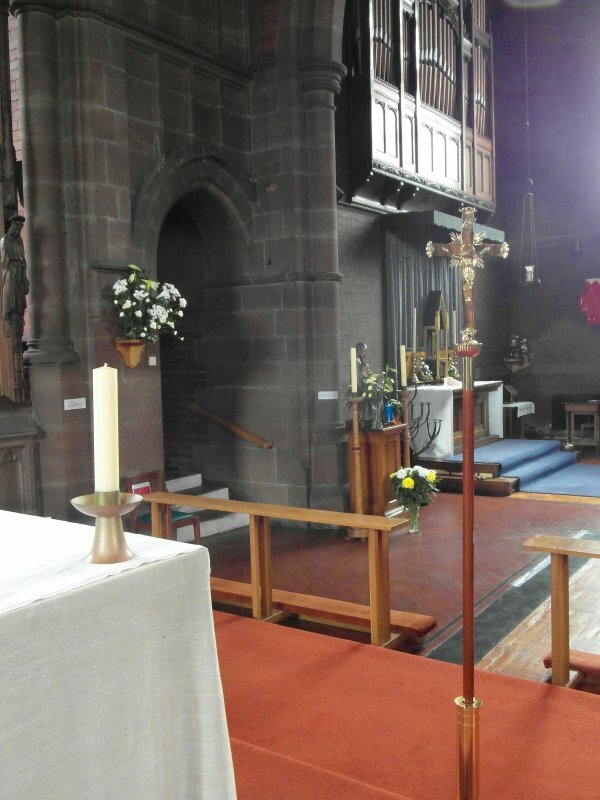 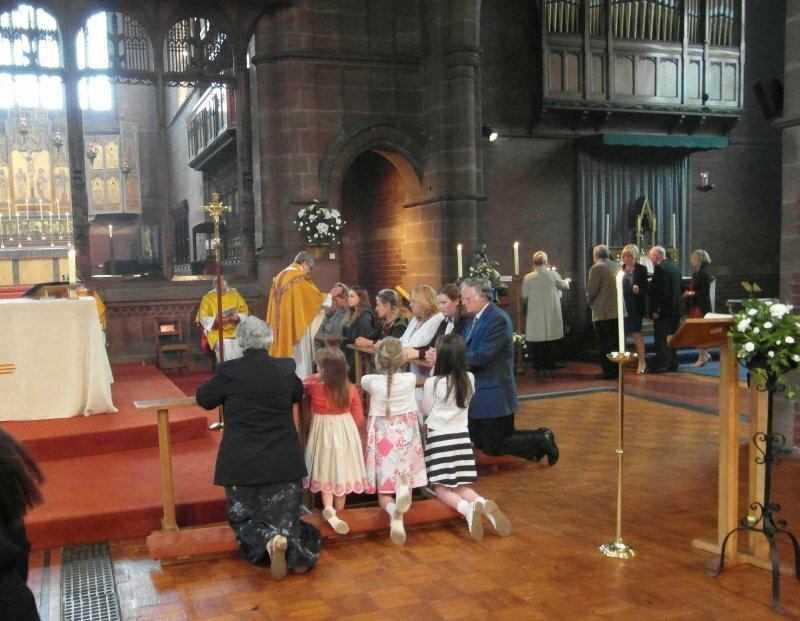 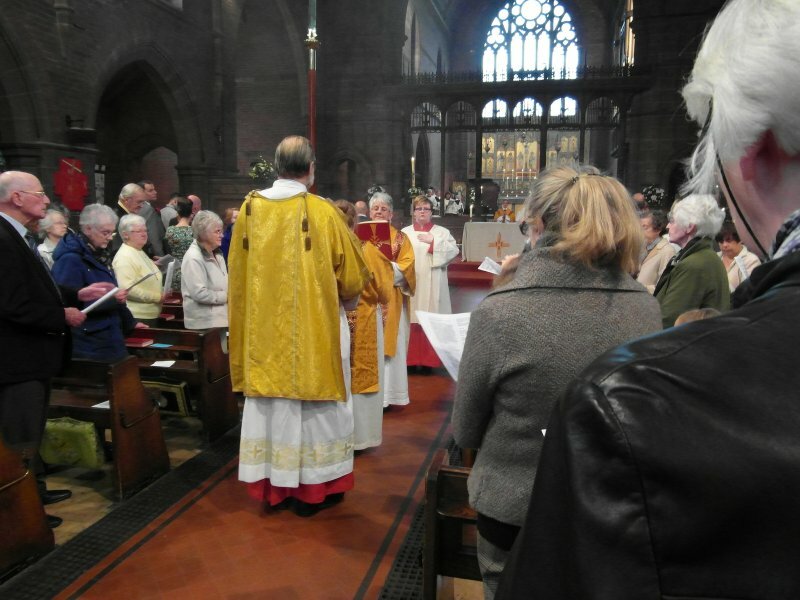 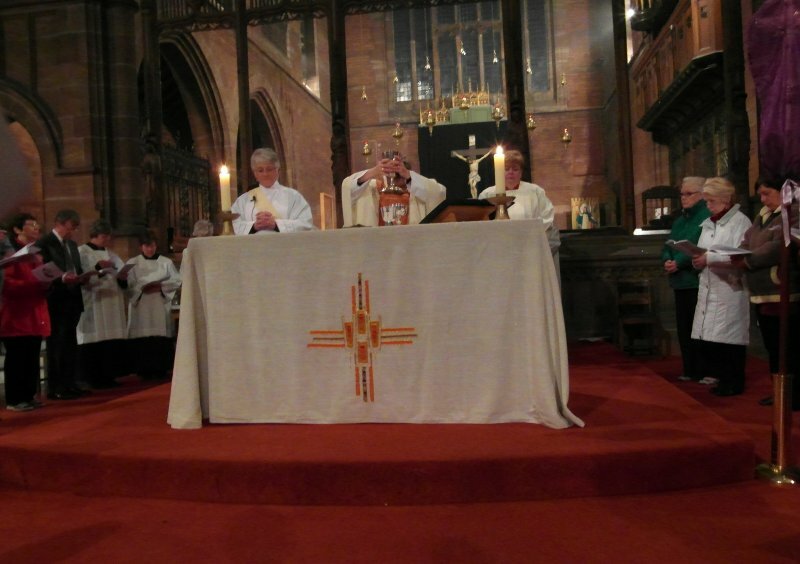 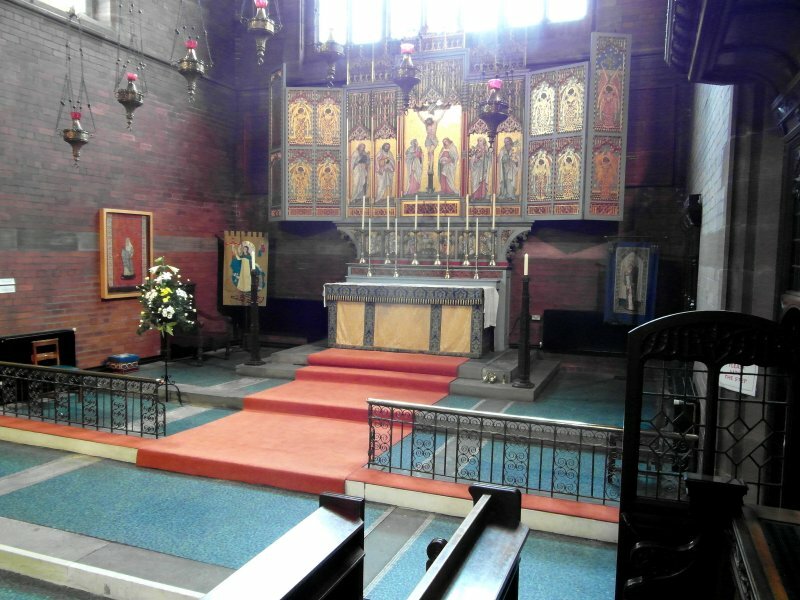 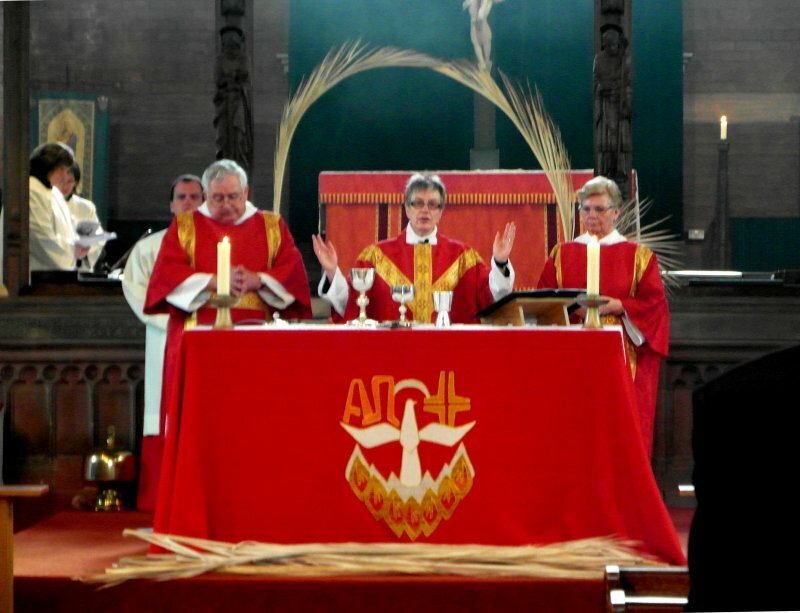 In St Faith's, as for many years, the congregation then gather round the nave altar for the consecration and communion. 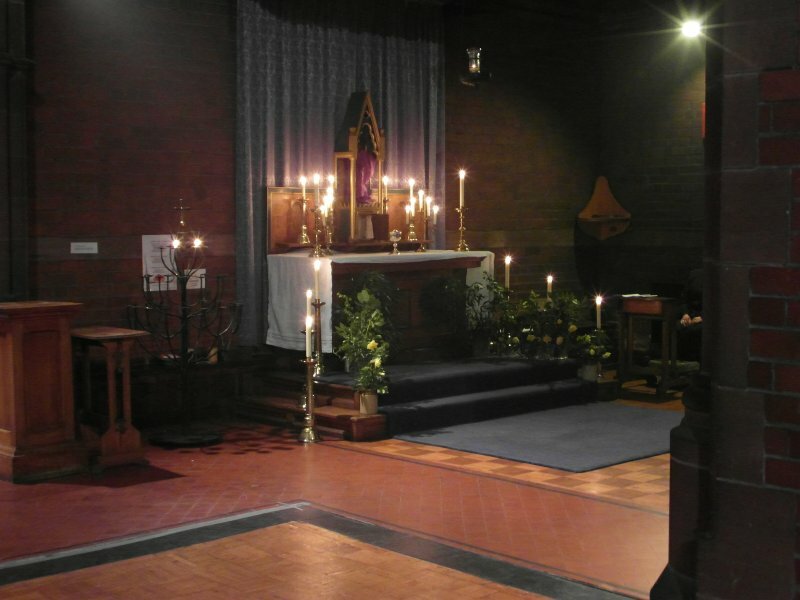 the Lady Chapel, decked out as the Garden of Gethsemane, and by the light of many candles. 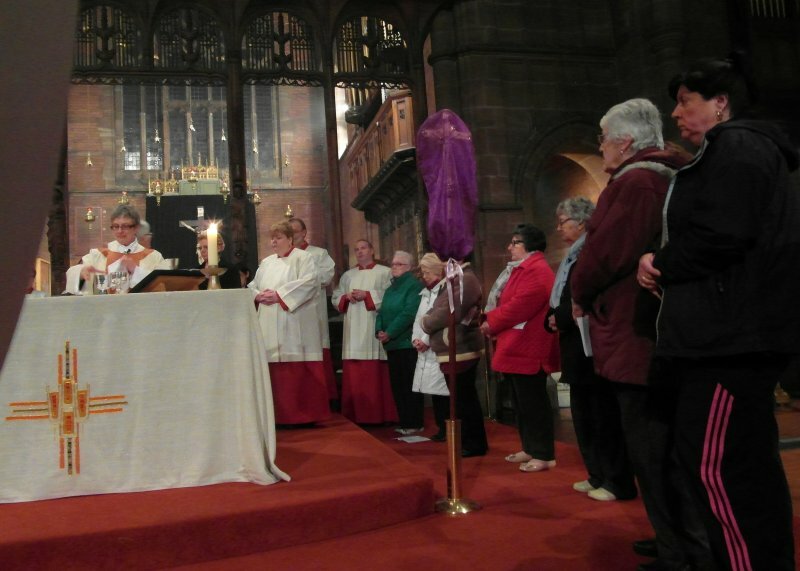 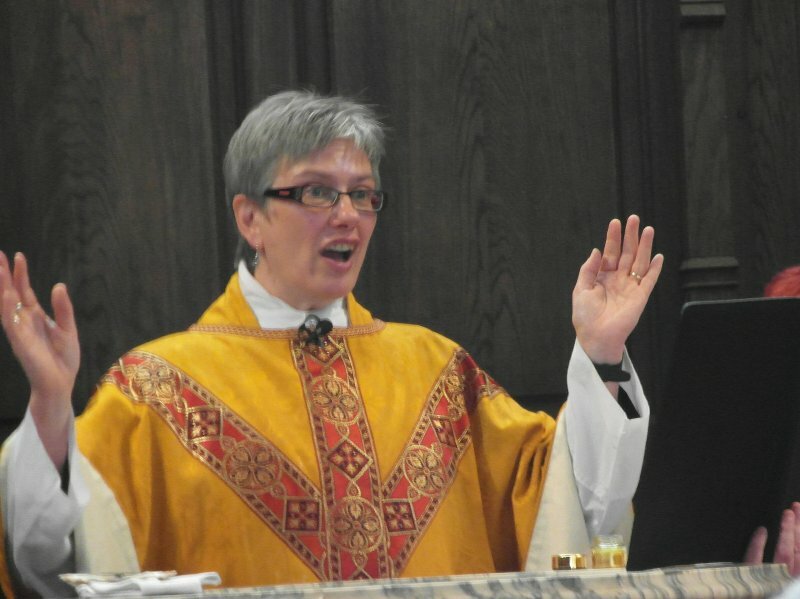 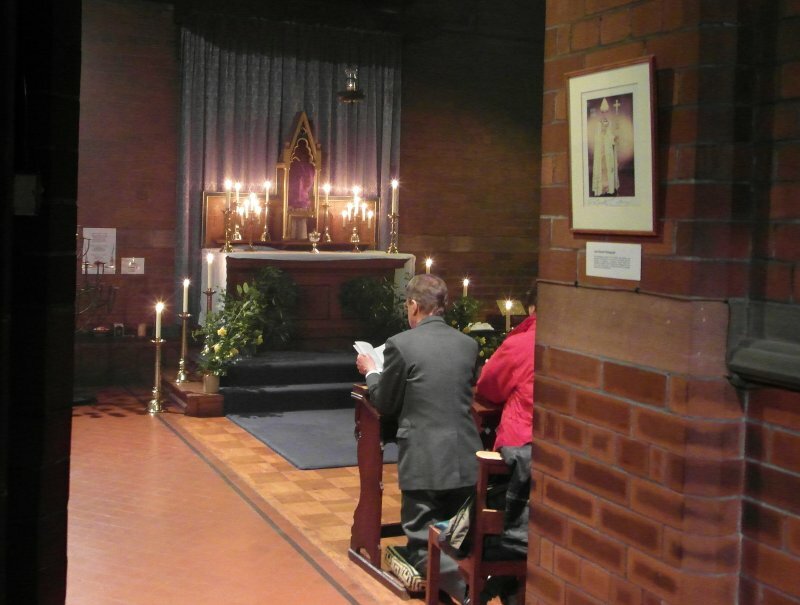 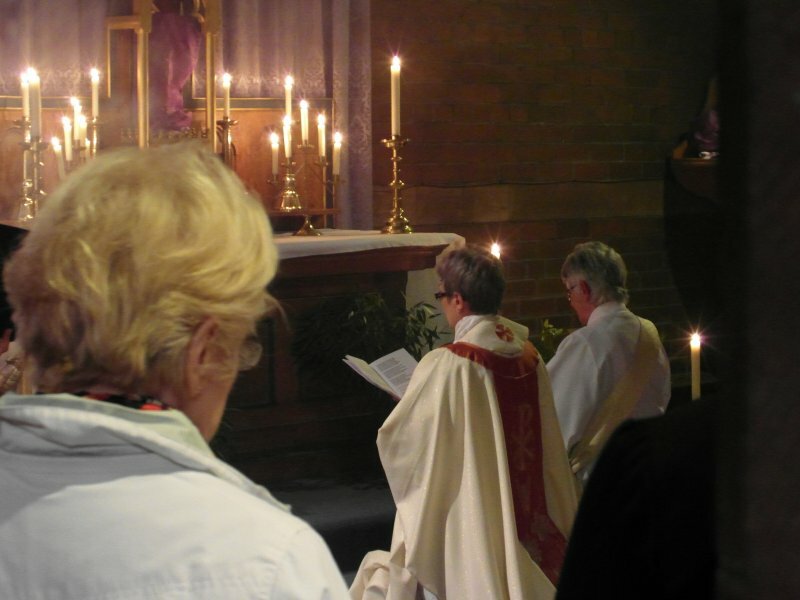 is kept in the Lady Chapel until midnight and the beginning of Good Friday. 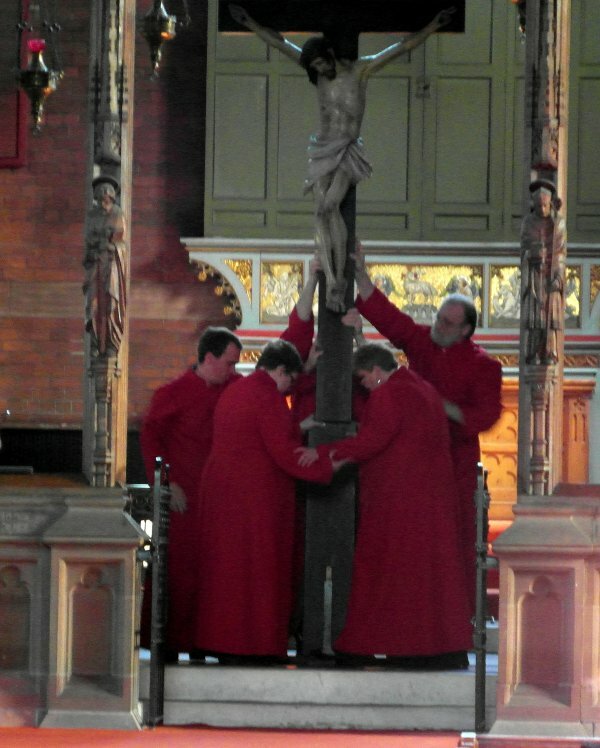 On the most solemn day of the Christian year, the Church recalls the sacrifice of Christ upon the cross. 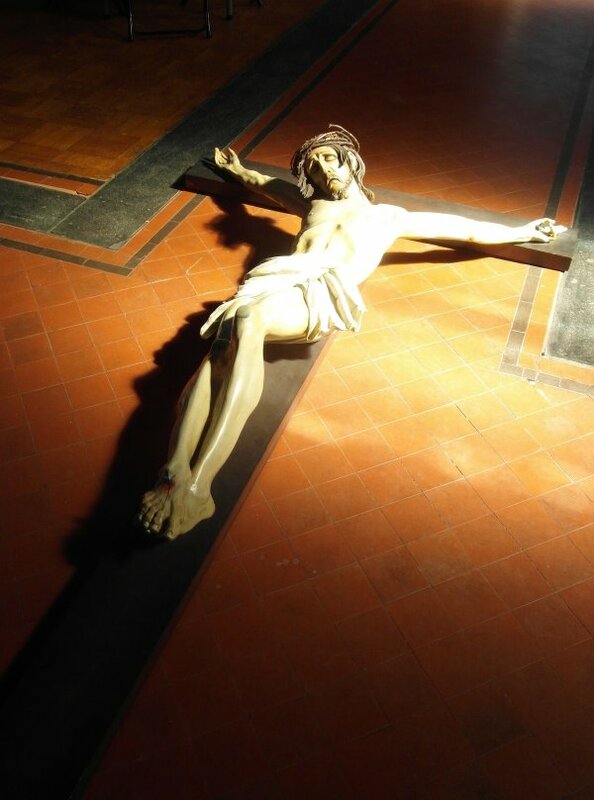 The Great Crucifix at St Faith's, the almost life-size statue of our Lord, lies ready at the back of church. 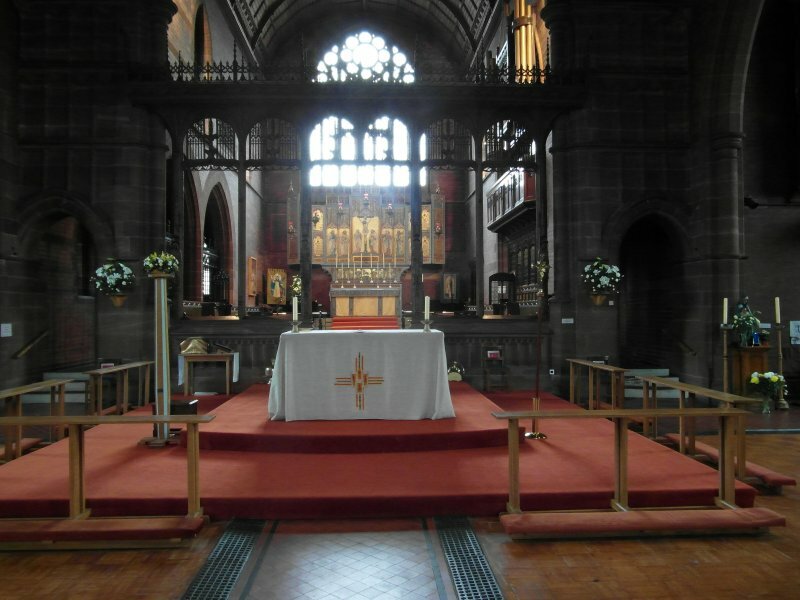 In due course it is borne aloft by servers, carried slowly to the sanctuary, and there raised on its stand between the choir stalls. 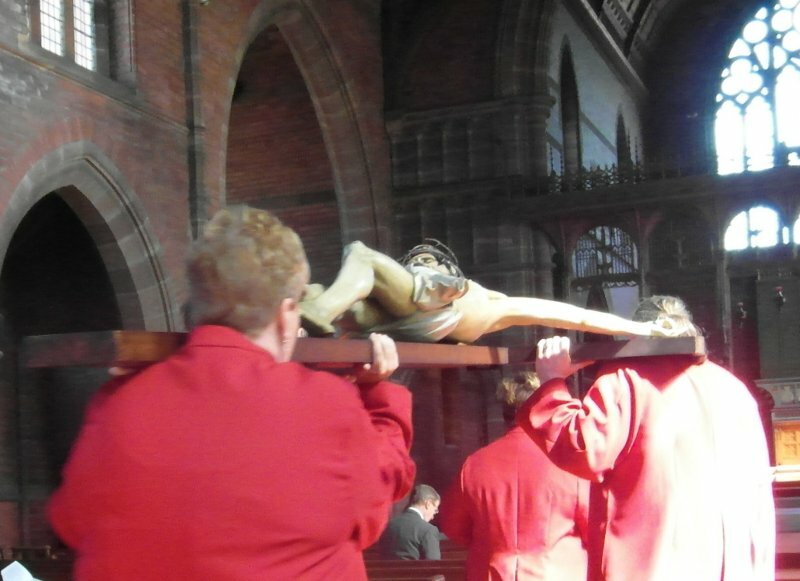 Towards the end of the Good Friday liturgy, we are invited to come forward and venerate the figure of the crucified Jesus. 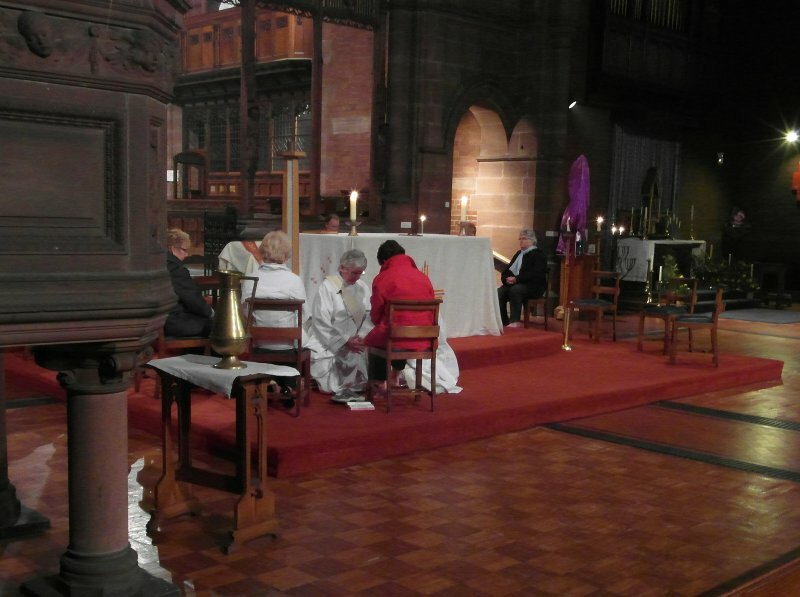 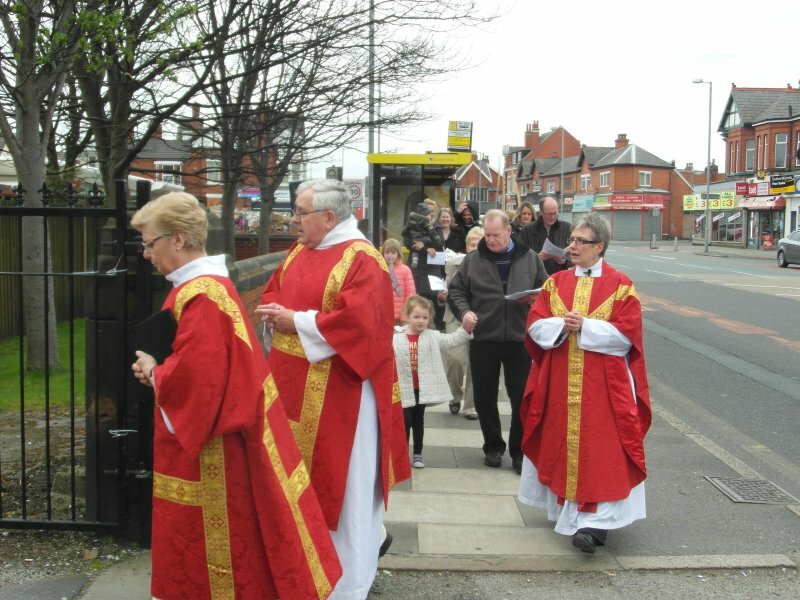 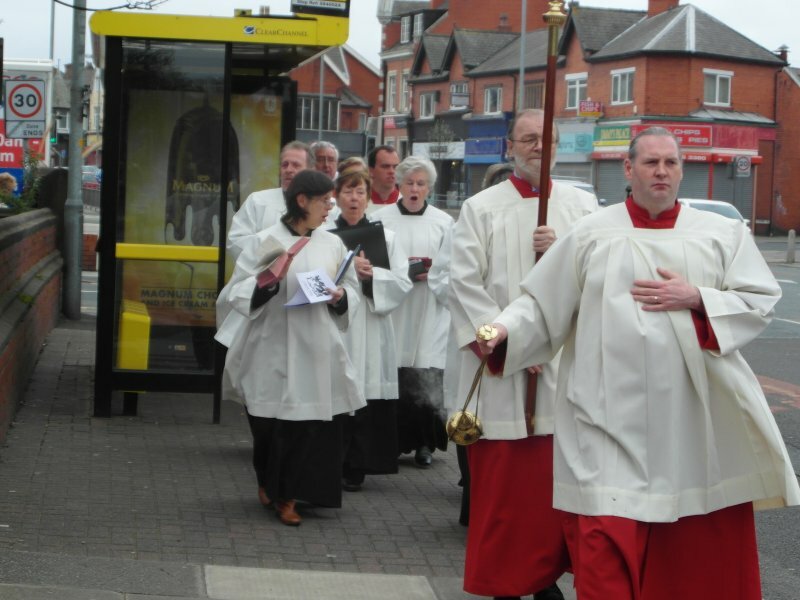 The service ends in quiet contemplation, at the hour that traditionally marks the moment of the crucifixion. 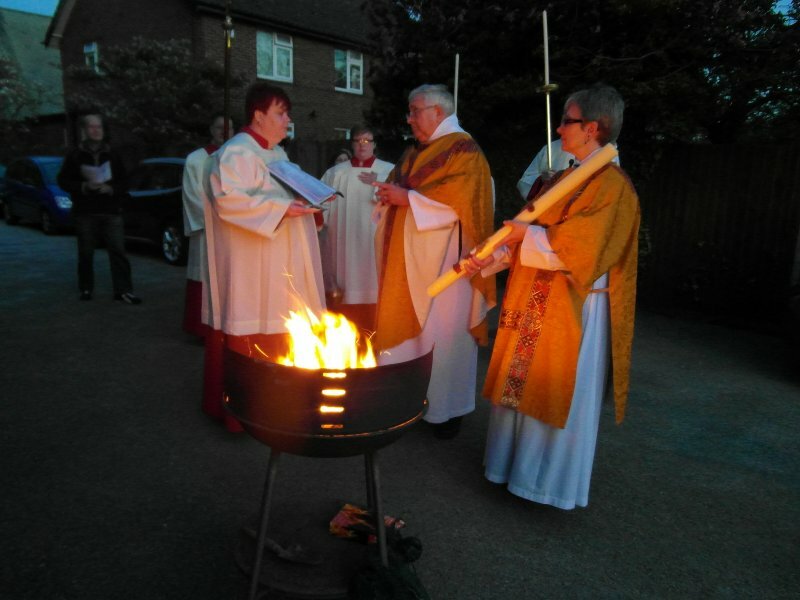 The day before Easter Sunday is also known as Easter Eve: it marks the time of waiting leading up to the joy of the Resurrection. 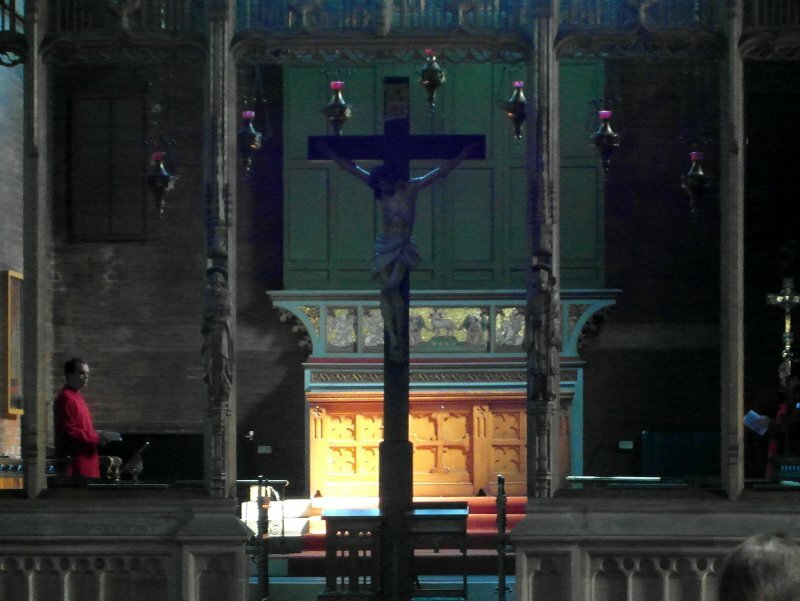 and the reredos, closed or draped since the beginning of Lent, is uncovered again in all its glory. 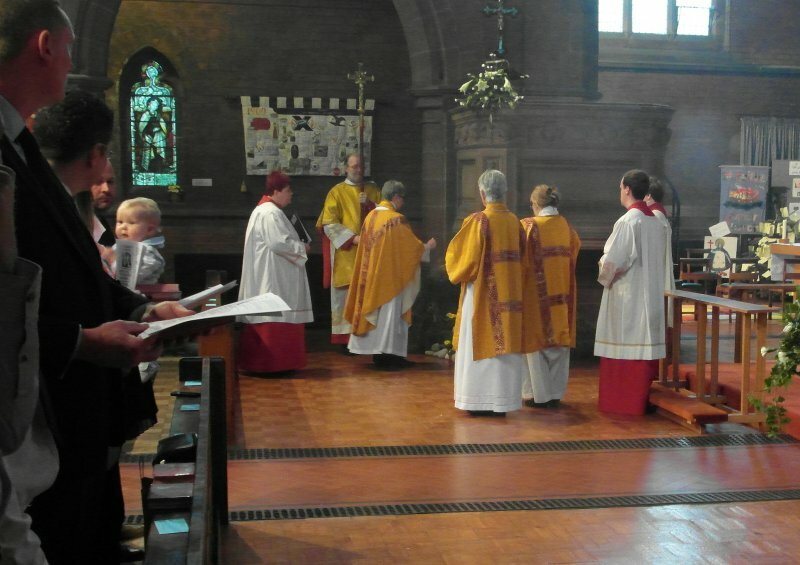 are told in a sequence of readings. 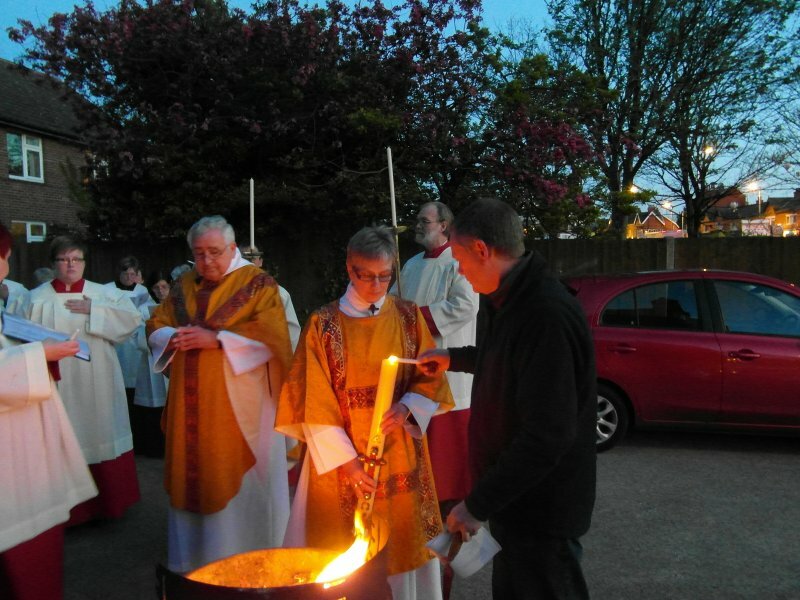 Then, as darkness falls, we move outside the church to where the New Fire has been prepared. 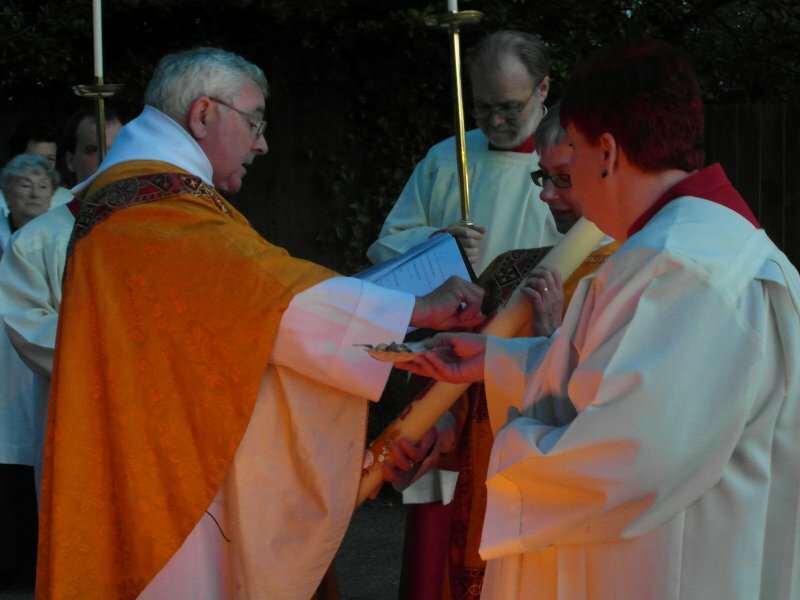 The new Paschal candle is prepared, blessed and lit as we move into church where its light spreads to all present. 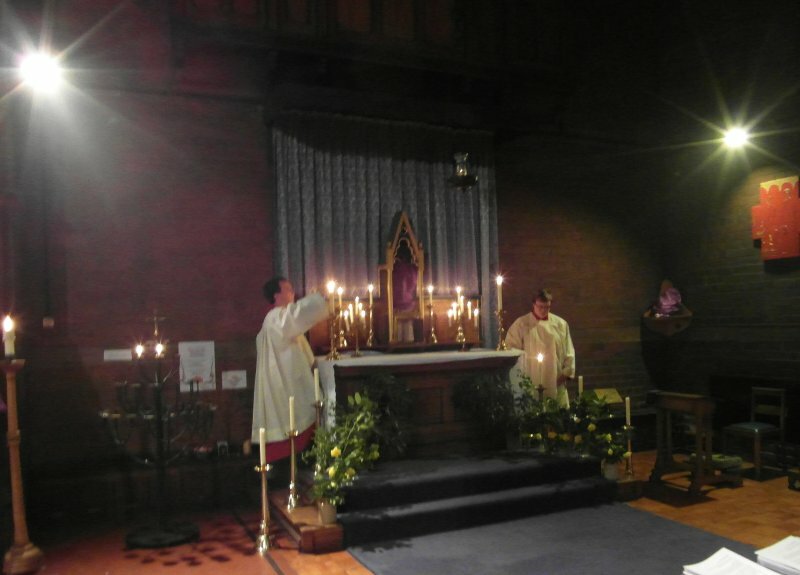 The music sounds forth and the lights go on, as the news of the resurrection is triumphantly proclaimed. 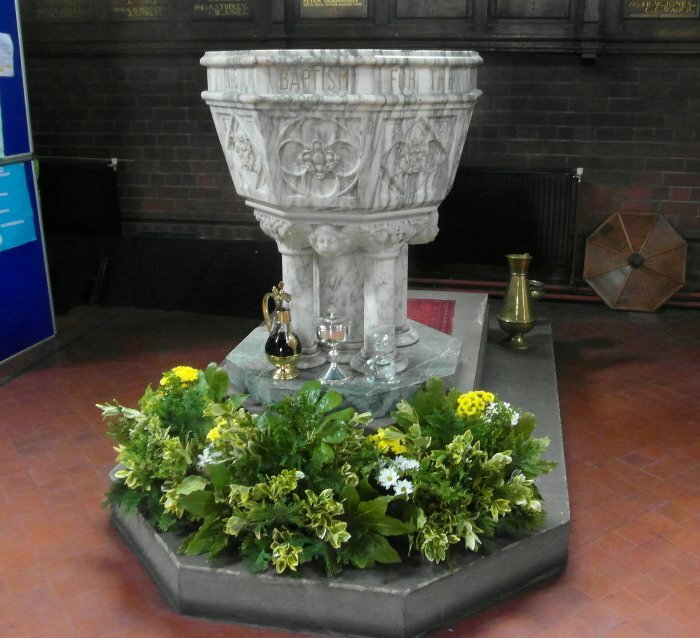 At the font, we renew our baptismal vows and are sprinkled with holy water before the first eucharist of Easter at last is celebrated. 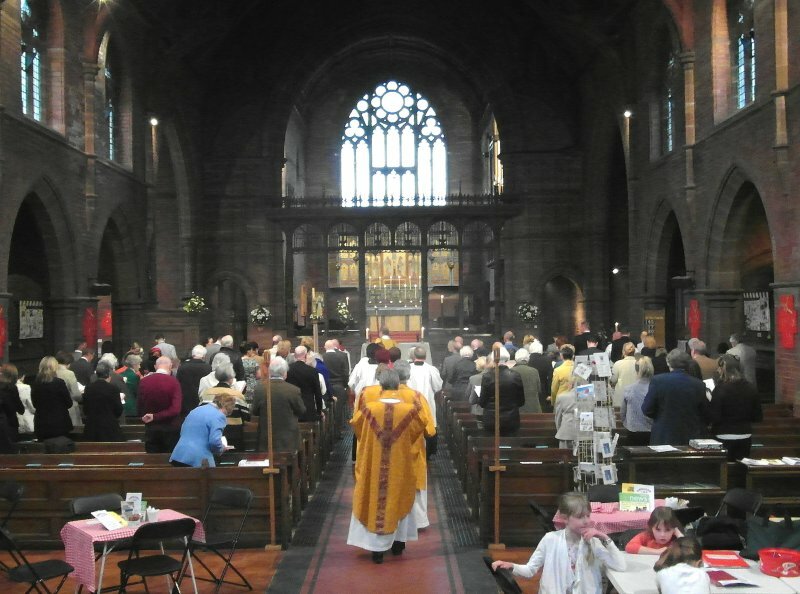 After the service, it is time for Easter biscuits and a glass of bubbly to toast the most exultant hours of the church's year. 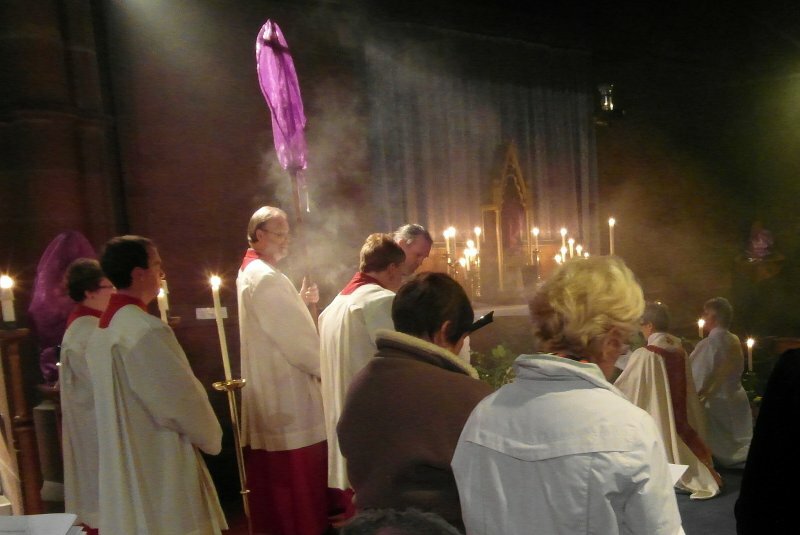 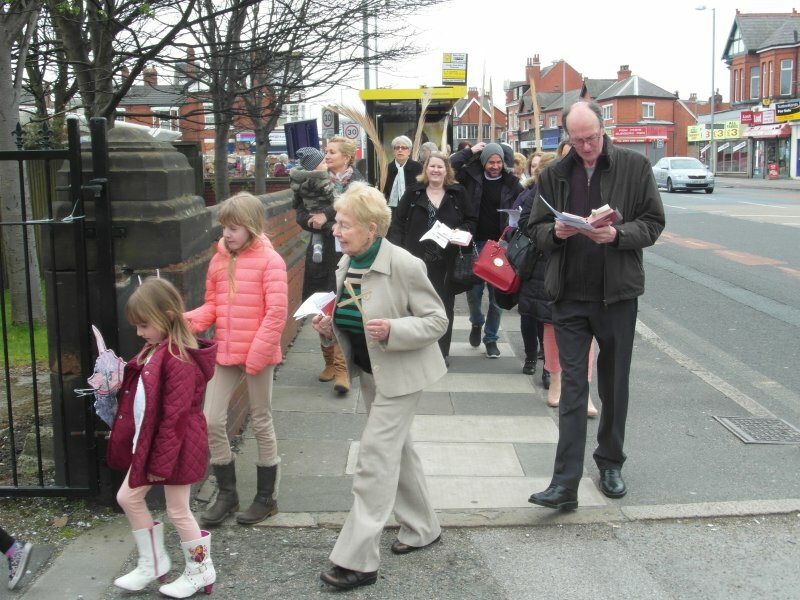 There was a well-filled church to take part in the celebrations and joy of the climax of Holy Week and of the Church's year. 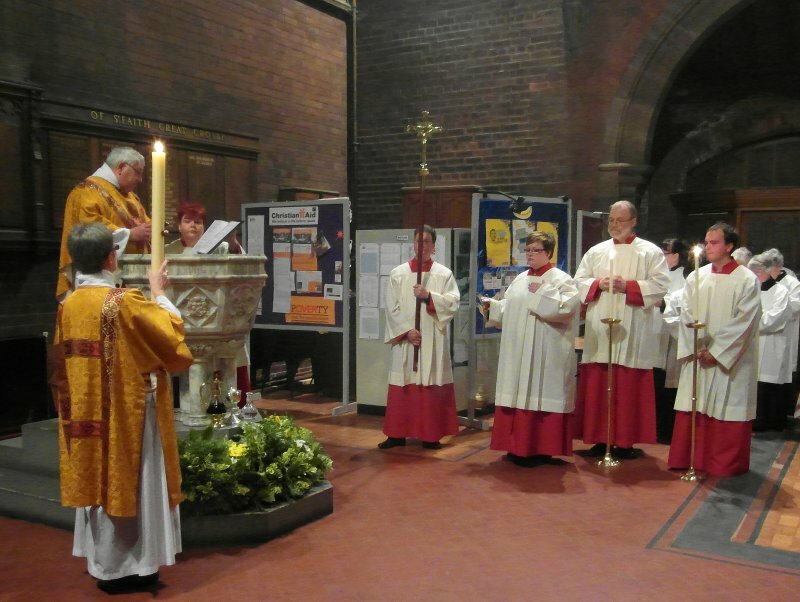 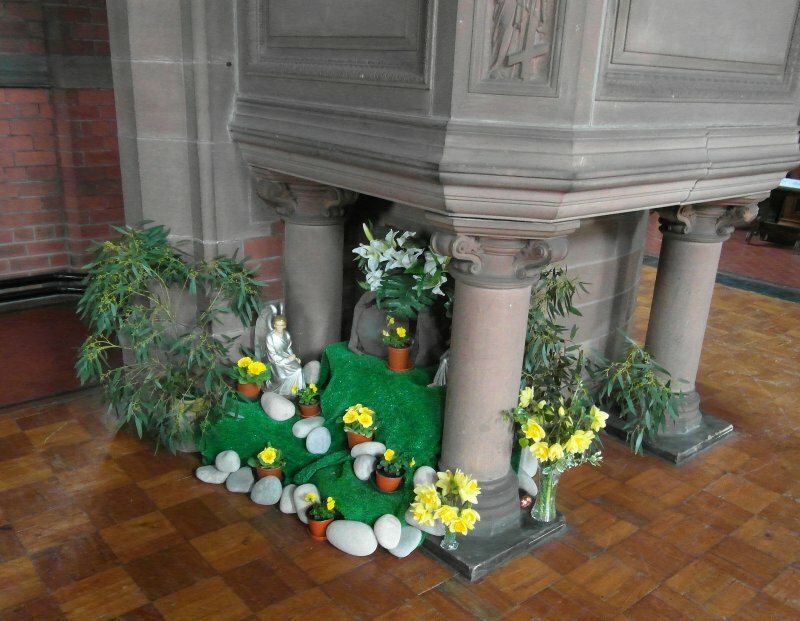 At the beginning of the service, the Easter Garden was blessed, before the Easter Gospel was proclaimed. 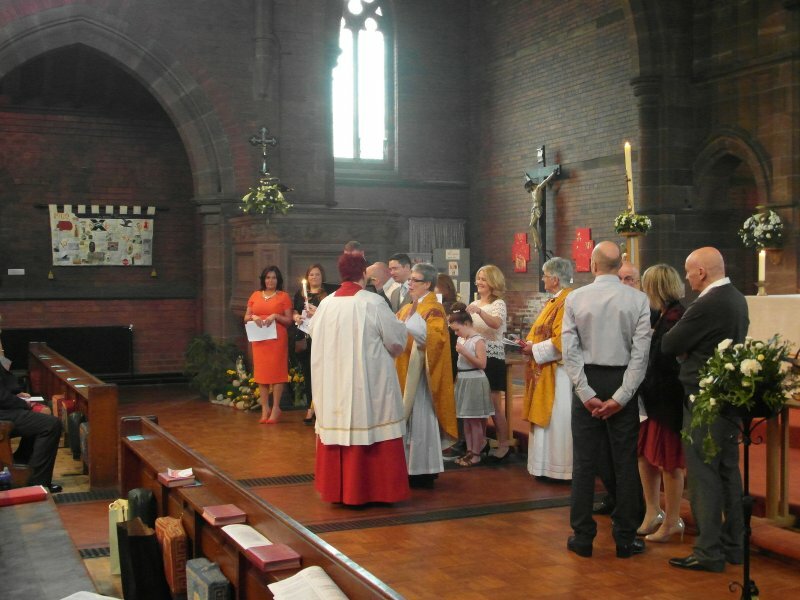 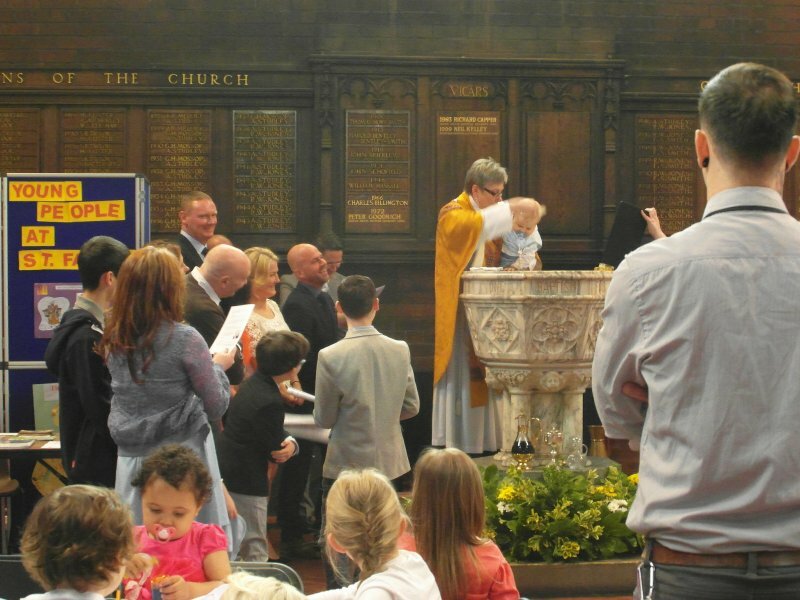 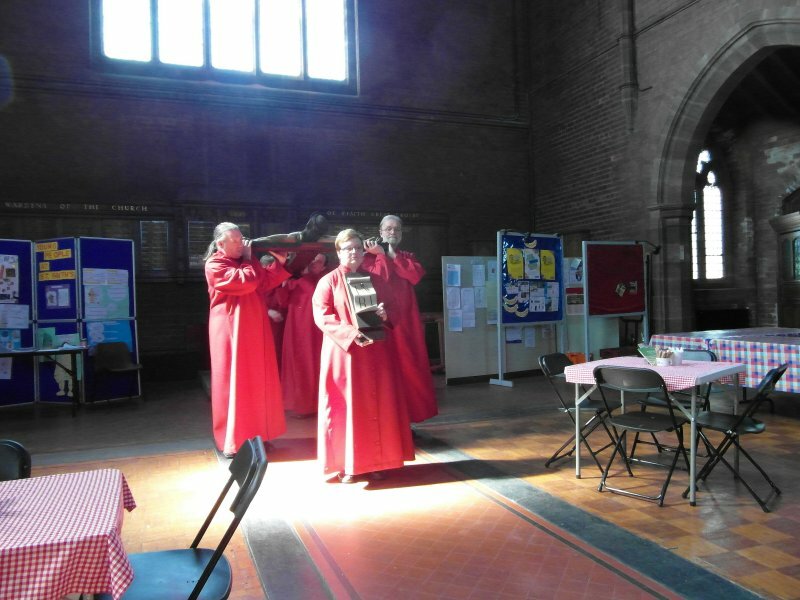 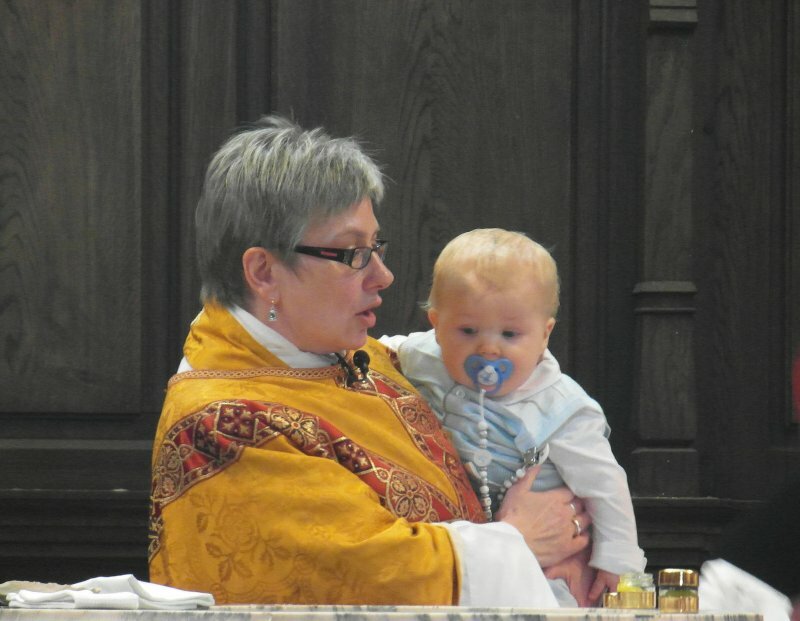 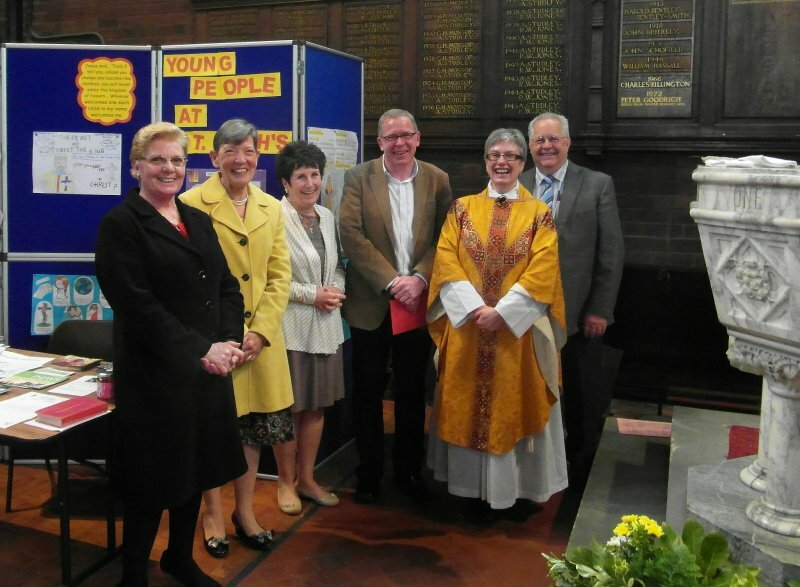 and many of them gathered round the font as Sue did the honours over a well-behaved infant. 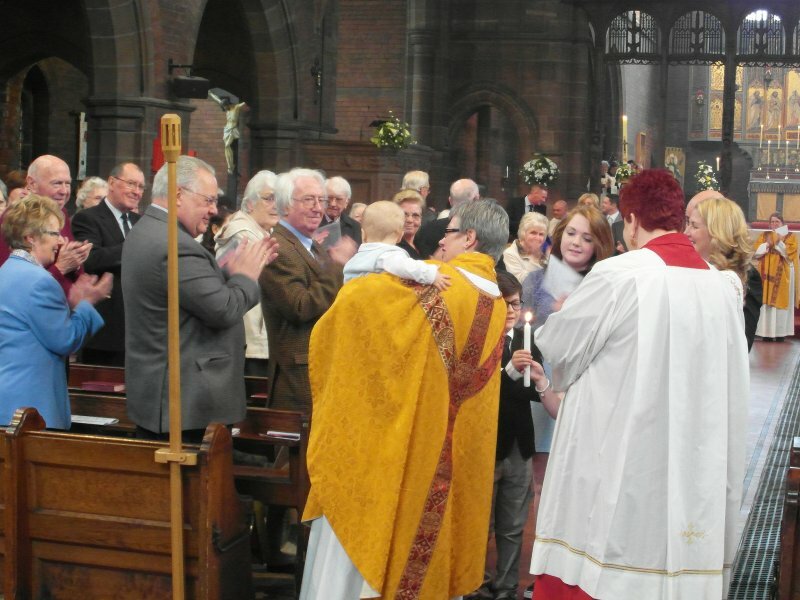 to the back again for all to see and applaud the newest addition to the family of Saint Faith's. 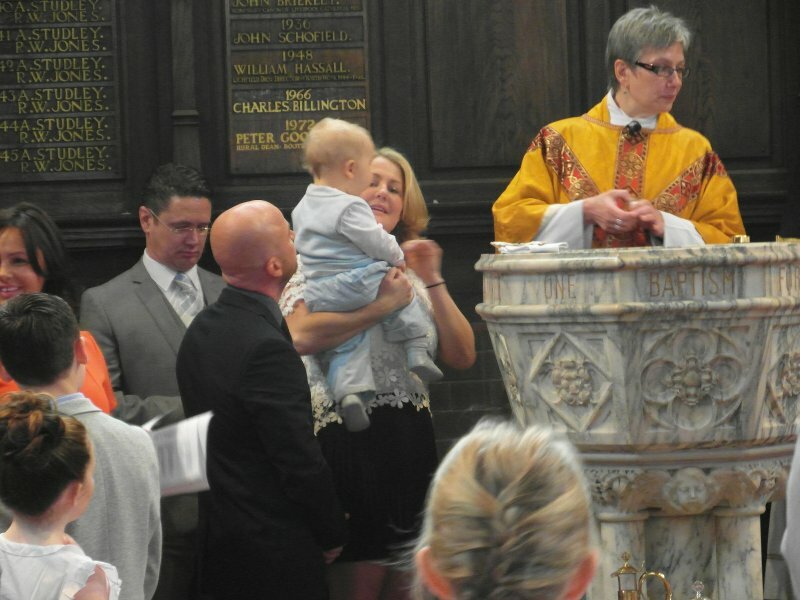 Leo's family had supplied wine to drink everyone's health in time-honoured fashion after the service. 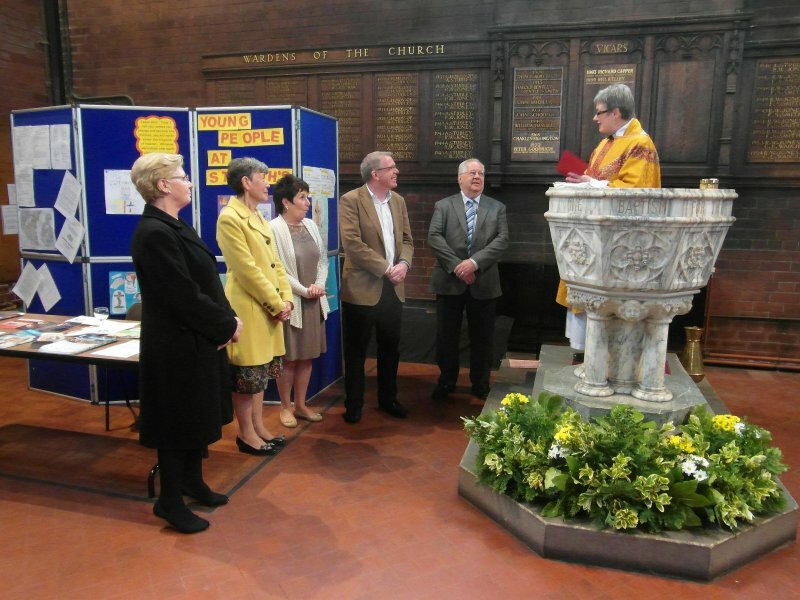 The font was then the backdrop again, this time for a presentation to Geoff Dunn, recently retired as parish office manager. 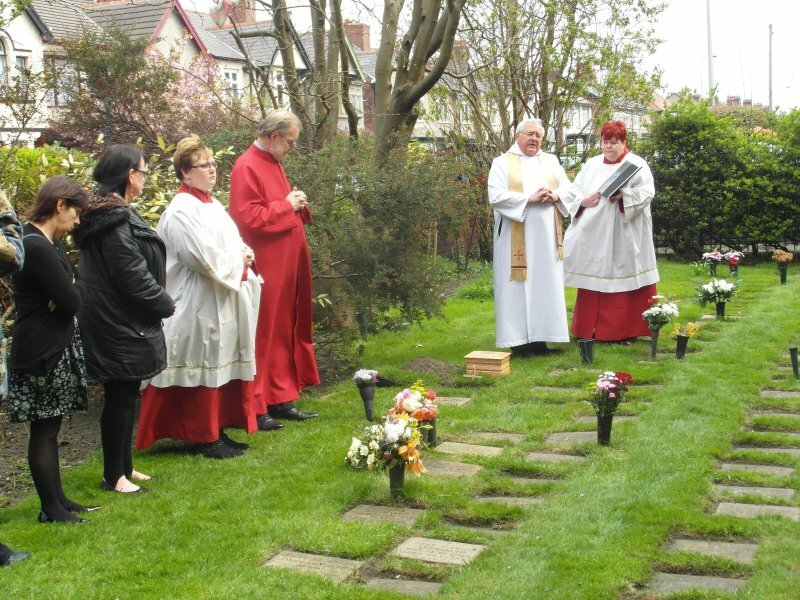 were laid in their final resting place in the Garden of Remembrnnce.